Beef Rib Blade Meat,(IMPS/NAMP 109B) is a small specialty beef cut with exceptional taste that offers chefs a tremendous opportunity for marketing on the menu. The #109B Rib Blade Meat, is a flat, somewhat thin piece of beef, that consists of muscles that are immediately below and above the blade bone and related cartilage of the primal rib. The surface is free of fat and all bones and cartilages removed. Although this cut is most often used as a raw material source for a variety of value added items such as marinated strips and steaks, it's great taste and juicy texture offers numerous options for menu items mentioned in the Beef Uses chart below. Great grilled and sautéed. In the video yesterday of Chef Sean Griffin, Chef was espousing the virtues of this cut cooked with the Bourbon Steak Restaurant butter poaching method. This is a highly versatile cut at an extreemly affordable price. 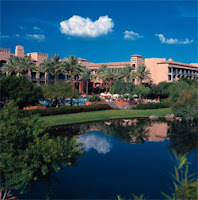 Executive Chef Sean Griffin chats with Peter Clarke of RED TV about the experience of dining in this 5-star location at the Fairmont Princess Hotel in Scottsdale, Arizona. Chef demonstrates the butter vats that they poach their steaks in prior to grilling over mesquite. 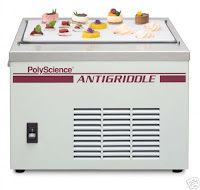 Check out this new tool available from US Foodservice SF: The PolyScience Anti-Griddle is a essentially a -30°F cold plate that flash freezes creams, sauces, purees, yogurt, and other liquids and semi-solids. It’s an easy-to-use tool for adding further imagination to your menu or presentations. The Grant Achatz inspired tool was designed to make a rapidly cooling surface that would give liquds and semi solids a crispy crust and a creamy interior. But imagine the possibilities it has created in the kitchen. To make an olive oil "cracker," most chefs would bake some sort of crisp fortified with oil. Achatz uses the antigriddle to freeze the oil itself into a wafer. At the Ritz Carlton Sarasota in Florida uses the Anti-Griddle at receptions. 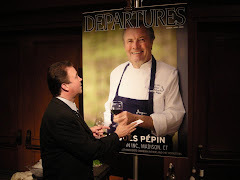 Executive Chef Frederic Morineau says guests get a kick out of seeing a liquid transform into a solid right before their eyes. From creating frozen ice cream stencils, and shapes, Creme Anglaze lollipops, as well as olive oil crackers you are only bound by your imagination with this tool! Watch as Phillip Preston President of PolyScience describes the creative process, or see Grant Achatz demonstrate the anti-griddle at the Nra show. (Feb. 23, 12:09 p.m.) Salyer American Fresh Foods, Salinas, Calif., is celebrating National Nutrition Month in March by collaborating with local chefs to promote healthy eating for kids. The company is sponsoring two events, the “Veggie ABC’s” at the Culinary Center of Monterey on March 12, and “Vegging Out Day” at MY Museum, Monterey, on March 29, said Marci Bracco, director of marketing. “We’re educating people on how to do more than just steam vegetables,” Bracco said. Veggie ABC’s will teach 30 children ages five and older about asparagus, broccoli and cauliflower and more, and will feature an interactive class where children learn about produce and create dishes with Mary Pagan, owner of the Culinary Center, according to a news release. Vegging Out Day at MY Museum features Brandon Miller from Mundaka restaurant in Carmel, Calif., who will teach a cooking class for kids. Read more in Dawn Wither's article at the Packer.com. The U.S. District Court for the Eastern District of California late last week issued a preliminary injunction finding that federal laws preempts a California law regarding regulations applied at federally inspected meat packing establishments. U.S. District Court Judge Lawrence O'Neill ruled that the Federal Meat Inspection Act preempts a California law that requires all non-ambulatory livestock to immediately be euthanized because the state law is different than and in addition to the federal law and usurps the authority of federal veterinarians and inspectors, according to the American Meat Institute. Check out the latest Weekly Commodity Update, or the Fresh From the Farm Produce Market Update. LALLApalooza and The LALLAgrill in Monterey will be cooking off their new butter poached prime rib menu in the near future. The butter poached trend was an offshoot of the Sous-Vide cooking menthod. Sous-Vide, French for "under vacuum," is done by vacuum packing portions in a plastic sealable bag and then slow cooked at precise temperatures which are much lower than typical cooking methods. The vacuum pack removes most oxygen from the food which can then can be immediately cooked or stored for later use. This has the effect of keeping harmful pathogens out reducing the risk of any food borne illness. The final product when using Sous-Vide has better flavor, color, texture and aroma with minimal loss of juices while at the same time greatly improving food safety. Immersion Circulators precisely control the temperature of the water and circulate it around the vacuum pack bags for even cooking. 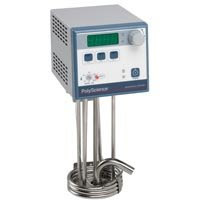 Immersion circulators can be clamped to an open pot, container or stainless steel tanks. Because the immersion circulators maintain an exact temperature, food is cooked precisely when using the Sous Vide method. Where Chef Thomas Keller has revitalized the Sous-Vide method recently with the release of his book "Under Pressure", Chef Michael Mina has received much attention with his verson of Sous-Vide using butter as the medium to seal the juices into the meat without requiring the use of sealed vaccuum bags. Michael Mina's Bourbon Steak re-adapted this method to accommodate its large-scale operations, which typically seat between 150 and 200 patrons at one time. Staff first poach steaks in clarified butter and herbs at 120°F. until rare. The poaching chambers resemble steam tables, but regulate temperatures by a tenth of a degree using individual immersion circulators. Though steaks are poached for 30 to 45 minutes before being served the fat holds in the meat's moisture, regardless of the poaching time. When the order is up, the staff finishs the meat on wood-burning grills fueled with real wood and charcoal. This not only caramelizes the steaks, but also brings them up to the desired temperature. I began hunting down equipment with calls to Techne USA and the Polyscience Culinary Websites. Both companies used to be strictly medical supply companies but with the revival of Sous-Vide they are adding culinary specialists to answer questions from confused distributor sales reps like me. Both companies were extremely helpful. Mikki at Techne was fun to talk to and she had to keep correcting herself when she would refer to tongs as forceps. Techne offered Chef Shae Gallante' of Cru' Restaurant in New York as a reference for their equipment, but I was unable to reach Chef Gallante today. The TU20D by Techne® has a temperature range capability of -40°C to +200°C and incorporates the additional feature of an RS232 port. Inventors of the "Clip On" thermoregulator in 1948, Techne® now offers five "Clip On" units. These Thermoregulators will convert your existing liquid bath or container into a precision temperature controlled bath with exceptional thermal performance. They offer a full range of options such as analog or digital set/readout, high pump output and RS232 interface. Jason at the Polyscience Corporation was much more in tune with the culinary world, and in fact was planning to attend the upcoming Pebble Beach Food and Wine with their equipment. He explained that the 7306c is the right product for butter poaching but warned that since the intake valve circulates the butter past the heater it is essential that you fully melt the butter prior to inserting the unit into the pan. Once the butter has been liquified the precision temperature controls will hold the temp to within 0.09F. Immersion Circulator are not just for Prime Rib anymore. Chef's are poaching lobster, fish, and more. In fact, Jason said, he has one Chef doing a maple poached whole duckling right now. Pour the clarified butter into a Dutch oven pot or roasting pan. Add the thyme, rosemary, bay leaves, shallots and garlic. Preheat the oven to 300 degrees. Submerge the ribeye into the butter and slowly roast until the internal temperature of the meat reaches 130 degrees. Remove the ribeye from the butter and season with salt and pepper. Heat a large skillet over medium-high heat. Place the roast into the skillet and sear on all sides adding clarified butter as needed. Remove the meat from the skillet; place on a cutting board and slice. The butter may be strained and re-used several times. The shortened history of this concept finds its roots in the Sous-Vide cooking method. Sous-Vide is French for “under vacuum” (Check out the Vacuum Sealer unit and replacement bags used in Sous-Vide cooking on page 262 of the NDG catalog) and has had resurgence over the past decade or so. 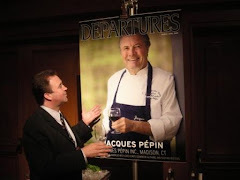 Most recently it has been popularized by Chef Thomas Keller in his book Under Pressure and with his television appearances including a cooking demo on the today show. 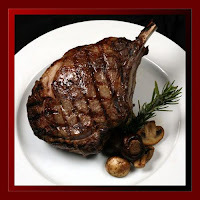 Chef Michael Mina has adapted the method for slowly poaching prime rib at his Bourbon Steak restaurant concept. On the butter subject the theory is that the fat from the butter holds in the moisture of the meat, be it beef, duck, fish or whatever you are poaching. Further the long slow temperatures of the cooking keep the meat from expanding and releasing its juices or absorbing the butter. Rather than tying up multiple ovens full of pans of hot butter at Bourbon Steak, Chef Mina has created a series of beef bathtubs (my kind of spa treatment) that are filled with clarified butter that are temperature maintained to within 0.09F by a product that is coincidentally available right here at US Foodservice (ok special order call Mike Crispi) called a Thermal Immersion Circulator. you will be replacing it soon. Anyway, thank you all again it was a total team effort to get this info to my customer rapidly. Use the Street Talk blog and email to keep in contact with your peers, you would be amazed how many people-not just in Livermore, but across the country- at US Foodservice are willing to help. When asked in which ways they would like to create more distinctive burgers for their menu, operators most often pointed to the cheeses, breads, toppings, sauces, and beef / proteins used. While Kobe and Angus burgers are growing fastest, other meat options are also making a move. “Steak” burgers are on the uptick, with a 44% increase in penetration over the past 3 years. Meatless options – Gardenburger™, soy burgers, and veggie patties – have grown 28%, while turkey burgers are up 14%. Look for more "homemade" veggie burgers on the menu. Locally Big Sur River Inn, and the LALLAgrill have been making thier own veggie burgers. 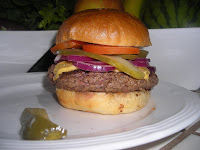 Burgers marketed as sirloin, however, have remained mostly flat. Interestingly, though, sirloin burgers are among the most expensive found in restaurants today as such, we may potentially see them grow in the coming years as the “upscaling” trend continues. Consider the fastest growing burger cheeses over the past 3 years specialty / non-traditional burger cheeses dominate the top of the list. Even in aggregate, specialty cheeses – defined here as any variety other than cheddar, Swiss, mozzarella, American, provolone, or jack – are growing very fast. Bleu cheese burgers in particular have become far more prevalent in recent years in several segments, exploding most notably among QSR and Midscale restaurants. Pepperjack has also boomed, fueled largely by strong adoption by major chains like Wendy’s and Hardee’s. This, in turn, has facilitated rapid proliferation throughout the QSR segment. Applewood-smoked bacon and chipotle are among the fastest growing burger toppings, each having grown over 200% over the past 3 years. Hormel offers a fantastic jalapeno bacon that-it is rumored- Thresher Rolle purchasing and logistics coordinator at the Ranch Club at the Santa Lucia Preserve keeps in his storeroom and snacks on all day long. Caramelized onions are another growth area, along with garlic, Cajun spices, and jalapenos. BBQ sauce, long a burger mainstay, is also popping – with notable growth rates across all restaurant segments. Check out Willy's Smokehouse's assortment of BBQ sauces served on the table to customize your burger to your liking. I keep hearing that people are trading down for their food choices, ordering burgers instead of Akaushi. steaks, chicken instead of dry age steaks. (Indeed it seems like our buyers in the office keep running out of these two items.) But the bar business is doing alright. "In troubled times people still drink" Whatever, sounds like someone is trying to justify going on a binder. Hey if you need an excuse, I'm hear to help. Check out Modern Drunkard Magazine and their 365 reasons to get soused. They have been standing up for your right to get falling down drunk since 1996. In case these "troubled times" ever actually end you want to be prepared and these folks can help. The Monterey City Council is expected today to approve the second reading of an ordinance banning the use of polystyrene foam packaging in restaurants, catering trucks, grocery stores and other prepared-food outlets. The law would take effect six months later. The measure approved Feb. 3, but subject to two public readings before becoming law, bans polystyrene foam and requires the use of recyclable, biodegradable or compostable packaging. Foods packaged outside of the city, but sold in the city, are exempt, except for those slated for use during special events. Representatives of the California Restaurant Association said they earlier successfully lobbied the council to deem as environmentally acceptable other plastic products coded with recycling symbols Nos. 1-5. They said the CRA successfully lobbied to exempt from the ban polystyrene straws, cup lids and cutlery. Amalia Chamorro, director of local government affairs for the Sacramento, Calif.-based CRA, said that while hard polystyrene containers are not banned, the city advises restaurants not to switch from polystyrene foam to hard polystyrene. Instead, restaurants must switch from foam to the approved recyclable, biodegradable or compostable products, she indicated. Wording in the ordinance indicates that the council is banning polystyrene foam because it does not biodegrade on its own and is not yet economically viable to recycle in the city and, as such, poses a threat to the environment of the nearby Monterey Bay National Marine Sanctuary. A solid waste, such as polystyrene foam, that does not biodegrade and is not recyclable poses an “acute problem” for any environmentally or financially responsible solid-waste management program and therefore should be banned, the ordinance's wording also suggests. making a traditional storable cheese when sales softened at yearend. through food service outlets is often slower. Higher Live Cattle prices has driven margin out of Beef production. to force higher prices across the Beef complex. through the end of the month. afternoon to relieve inventory concerns. remain restricted the Round complex will remain steady. due to the decreasing value of Cow lean meats for grinding. expected to pick in the near future. forecasters do not believe any dramatic shifts upwards will occur. suppliers prefer to move whole birds into retail. hazy on just how this will affect prices for Thanksgiving. unchanged, though inventories continue to deplete. the market from all areas is steady to full steady. full steady. Larger count shrimp are about steady for a quiet demand. Lobster Tails, American, 4-5 oz. will soon be available to the market. Lobster Tails, Caribbean, 5 oz. levels with reduced supply being matched with dull demand. cases in Alaskan origin product specifically. and most of the current catch is going live. weakness was noted on super lump. within the Chinese origin product. previously, putting downward pressure on prices. Catfish, Bnls & Sknls Fillet, Fresh, Domestic South, 5-7 oz. softened. This is a great value fish!!! Cod, Sknls/Bnls, Shatterpack, Double Frozen, Atlantic 8/12 oz. is a result of overfishing or poor management. 2004 and will be the lowest pollock harvest in three decades. increase in supply of twice-frozen fillets. supply and demand suggest upward price pressure. as we would normally expect. Pollock, Fillet, Pacific, Double Frozen, Sknls/Bnls, IQF, 2-4 oz. is expected to worsen even further starting in March / April. is steady and most likely will going forward. the winter, especially on once frozen..
be promoting through lent and beyond. processing factories are now closed for the Chinese New Year holiday. then this practice will continue and prices should ease further. Tilapia, Fillet, Taiwan/China, IQF, 3-5 oz. stronger USD could mean softening market. Tuna, Yellowfin Steaks, Treated (CO), 8 oz. that things may be heating up there. Squid, Loligo, Tubes & Tentacles, China, Frozen, 5-8 in. pricing compared to 2007 levels is expected to remain unchanged. overall avocado pricing will stabilize at that time. but pricing is not expected to strengthen because of unsold supplies. hold the frozen Chilean prices down. been quiet as buyers wait to see the impact of the new Chilean pack. conditions to date have been favorable and the fields are dormant. frozen pack is complete and contract commitments have been satisfied. dropped and is expected to remain weak. pack since 2002 due to the same weather that damaged the apple crop. Kent used for freezing also remains very high compared to last year. even higher levels than at present. and it appears this will be the case for the foreseeable future. currently has sufficient Red Lady variety to offer in IQF. though the weather damaged cling peach crop was extremely short. Slow food service movement is impacting this inventory movement. the strongest time of the year for pineapple production in Ecuador. end of 2008 there was hardly any pineapple available for process. towards the beginning or middle of February. finished in early December, having met production forecasts. are either stable or firming. Northwest is a bit under budget as beans were a start/stop season. were on budget in the Northwest, but below budget in the Midwest. have met forecast for December and we expect the same for February. hold firm through the Chinese New Year (early February). haven’t had any problems keeping up with shipping schedules. see good/solid production from January-March from this region. fully expect to meet forecasted volumes for January. weather. Will this lead to a higher California frozen price level? may not see a price shift just yet. item is not as impacted by the internal fresh market as broccoli. supply changes through May as long as the weather remains mild. us and looking to minimize any impact at the beginning of the season. They are not confirming additional tonnage at this point in the pack. was good and they met budget. that this could last up to 3 more weeks. and movement of their product. with the new crop. Markets will be Steady. limited throughout the year. Markets will Remain Firm. Foodservice has secured adequate inventories throughout the year. domestic and export demand rising due to published health benefits. inventories to meet growing demand. The MARKETS ARE FIRM. product costs. Markets will Remain Firm. can costs. Markets will Remain Firm. demand. The MARKETS will be FIRM. will be tight as the year progresses with the below budget new pack. have also been affected by the frost during the growing season. FIRM, but expect increases on the horizon. the steel can increase. Markets will be FIRM. with more increases to follow throughout the year. pack is now complete with Processors reporting a below budget crop. tight supply throughout the year. Markets are FIRM. and increases anticipated throughout the year. a near budget pack. Markets will remain FIRM. pack is now complete with a budget pack reported. Markets are FIRM. is complete with a budget pack. Markets are FIRM. pack is complete and supplies are available in all styles..
year. Markets remain FIRM with tight inventories prior to new pack. pack is complete with adequate inventories. is complete with most suppliers reporting a near budget pack. pack processing is complete with reports of a below budget harvest. Strong demand continues to out weigh expected crop tonnage. increases to follow throughout the year. in 2009. Markets remain FIRM. by mid February. The Market remains FIRM. pirates at least three times. for close to 50% of China’s pineapple export market. guarantee a continued order flow. and Chile have both ended their crop seasons earlier that forecasted. duty free access), while Spanish artichokes still carry a 13.8% duty. flowering is already on the plants and should be available soon. countries is still far from that of Spain, Chile and Peru. stronger U.S. dollar further lowered costs for the U.S. market. weaker dollar for a higher market price. Where Does My Ostrich Fan Fillet Come From?